It's too early to blame the wheel; the tire, tube or frame could be to blame. Or rider error. Or aliens. When I wreck/have a flat tire, it usually doesn't cause all of my spokes to explode. I don't give a damn what else may have broken or broken first. There's no excuse for the entire system of spokes to instantaneously disintegrate. Twist? Break? Maybe. But not the entire system all in a moment. Does the barbie doll yellow hair responsible for tension and the hollow carbon spokes just provide structural integrity? Fact: The valve stem is missing. One can see on the picture attached the location of the hole in the rim where the valve stem to the tire should be. Preliminary Indications: The shearing of the valve stem would occur under conditions where the tire moves, slides or fails, and the wheel rim continues to rotate slightly relative to the tire, cutting the stem. 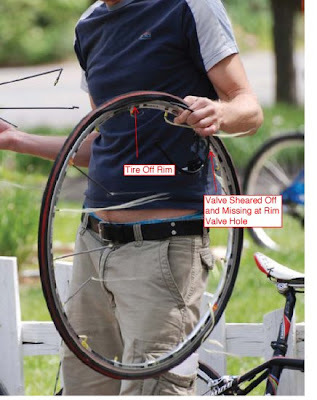 The forces needed to generate such an event would require that the integrity of the wheel (meaning hub connected to the rim by the spokes) had not yet been compromised at the moment the shearing occurred. Does anyone have more info on the prototype Specialized frame that Mr Delaney was "testing" when he crashed? Also, I've seen two photo examples of R-Sys failures (heard about spokes breaking), one at TDUnder and Delaneys. Where are all the other examples of completely destroyed wheels? There are 18,000 pairs of R-Sys wheels sold, why haven't I seen or heard of other complete failures? Did Mr Delaney's tire come off the rim? Could that be the answer? Something smells like there is a lawsuit in play here! Im riding a pair of Mavic R-sys rims and Im 105kg!! Never had an issue and they have been fantastic wheels....ride like a dream!